One of the most difficult passages in the Bible is found in Matthew chapter 24. Referred to as the Olivet Discourse, this part of the Bible is the main jumping off point for a lot of the prophecy teachings regarding a period called “the end time” or “the last days.” Matthew 24 is a frightening scripture that mentions earthquakes, wars and rumors of wars, famines, and pestilences, among the few calamities in store for planet earth. As the teaching goes, all of these horrible things will be a sign that the “end of the world” is right around the corner. Over the years, I began to realize that there is an entire industry that has grown up focusing on the “end time.” There are books, movies, conferences and seminars that support this area of Bible study. The basic pitch is that terrible stuff is coming! And why is that? Because they believe that the Bible tells them so. The pitchmen declare that they know best how to interpret all this apocalyptic imagery and symbolism. Of course, to avoid all this bad stuff you need to purchase their books, DVDs and attend a movie or two. Now I have to admit that they have a brilliant marketing plan. Maybe I should jump on the bandwagon, after all, they are making millions of dollars while I don’t make a penny from writing these articles. Well, what about this “great tribulation” that Jesus talks about in Matthew chapter 24? Won’t there be a seven-year global tribulation and persecution of Christians in the future? Well, the answer to that question may surprise you. Jesus does teach a future “great tribulation” but it is not in our future, it’s in our past. Allow me to explain. Passages in Matthew chapter 24 are the go-to passages people use when they start talking about the “end times” and “signs” that point to the “end of the world”. Most Christians can quote parts of Matthew 24 when discussing the “end time.” Now here’s where the problem is: context. Many Christians ignore the context given at the end of chapter 23 and the beginning of chapter 24. They discount or misunderstand the language of Biblical imagery that is commonly used by the prophets. So what is the proper way to interpret Matthew chapter 24? Is it possible that it does NOT predict a future tribulation and the end of the world as we know it? First, some important questions must be asked. Who is doing the talking? Whom is he addressing? Moreover, what is the purpose of the conversation? What makes this passage complex is the use of apocalyptic imagery which makes Matthew chapter 24 highly symbolic and a challenge to interpret. Apocalyptic literature is best known for its symbolic use of language. To understand apocalyptic, we need to cross two different boundaries. We need to study the imagery in the proper time and the proper culture. Now the context of the passage is the easy part: Jesus is talking to His disciples about the soon (in their lifetime) coming destruction of the temple in Jerusalem. This event, which was future to them, would constitute the “end of an age.” The age that would end was the Old Testament sacrificial system. It is clear this is the context. It is right there in front of us starting at the end of Matthew chapter 23. Jesus, in referring to the Jewish religious leaders declares that “Behold, your house is left unto you desolate. (Matthew 23:38).” The “house” that Jesus is referring to is the temple. Then at the beginning of Matthew chapter 24 the disciples point out the magnificent temple as Jesus continues: “And Jesus said unto them, See ye not all these things? Verily I say unto you, There shall not be left here one stone upon another, that shall not be thrown down.” (Matthew 24:2). Now please understand the dramatic effect that Jesus’ statement had on His disciples. Jesus was telling them in no uncertain terms that the Temple would be destroyed. This destruction would be so complete that not one stone would be left upon another. Now put yourself in the place of one of Jesus’ disciples. Wouldn’t you want to know more about this future destruction of the temple? Of course, you would. This prompted His disciples to ask more questions about “when will this happen” and “what will be the signs”? So clearly the context of this passage is the destruction of the Jewish temple and the signs His disciples need to look for. End of the World or End of an Age? Now, what’s interesting is that the Greek word for the English word “world” is not “kosmos” but the Greek word “αἰώv (aion)”. This word “aion“ means “a unit of time as a particular stage or period of history – “age, era.” It does NOT refer to the physical world. So what’s coming to an end in Matthew 24 verse 3 is the end of an age not the end of the world. Now, what does this have to do with the idea of a future “Great Tribulation”? Well, Matthew 24 is the foundation for teaching that a “Great Tribulation” is in our future. While it’s true that Jesus is describing a horrible period of tribulation, it is not in our future but our past. Instead of a global tribulation, Jesus is warning His disciples of a localized tribulation that was in their future – not ours. Jesus points out the signs to look for as this tribulation approaches. He then tells them to leave Jerusalem and head for the hills. Jesus even tells them which hills to flee to – the hills just outside Judea. Of course, if Jesus were referring to a global tribulation this would have been terrible advice to everyone not living in the immediate area of Jerusalem. Then Jesus goes out of His way to assure them he is talking about their time and generation. The tribulation Jesus speaks of in Matthew 24 would not happen thousands of years in the future. Jesus does this by using the time marker “this generation”. Notice that Jesus doesn’t say “that generation” but “this generation.” The original audience, His disciples, would have known that Jesus was referring to world changing events that would happen in their lifetime, in their generation. So what Jesus has promised is that things will never be as bad as they were in the “Great Tribulation.” This event occurred within the lifetime of his listeners – 70 A.D., just as Jesus had predicted. The Roman army under the leadership of General Titus destroyed both the city of Jerusalem, and it’s magnificent temple. History tells us that over 1.1 million Jews perished in this siege. And this was during a four-month period and didn’t even count the tens of thousands of Jews that perished outside of Jerusalem. This misinterpreted passage has caused an untold number of people to fear the future when it should cause them to view the future with hope. But that’s often the result when we misinterpret scripture to fit our worldviews or today’s news headlines. Now obviously, there’s a lot going on in Matthew chapter 24 that I have not yet covered. The purpose of this article is simply to point out that the entire context of this passage centers around Jesus answering the question, “how will we know the destruction of the temple is about to happen?”. Everything, and I do believe everything that Jesus talks about in the Olivet Discourse must be interpreted in light of the question he is answering. Jesus was speaking about the destruction of the Jewish Temple, and history tells us this happened in A.D. 70. Then Jesus himself declares in Matthew 24:34: “Verily I say unto you, This generation shall not pass, till all these things be fulfilled.” We know from the context of the passage that Jesus was speaking of events that to us, are in the past. So is there a “Great Tribulation” in our future? Well, I must admit that the world is in a mess. Maybe events are building up for the start of world war III. If you believe this, I cannot blame you for thinking that way. However, the question is not whether we will all die in a future thermonuclear war. The question becomes does Matthew chapter 24 describe a “Great Tribulation” that is in our future? 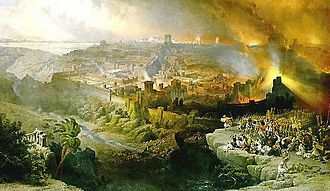 It is clear from the context of the passage that the “Great Tribulation” that Jesus was referring to occurred in A.D. 70 with the destruction of the city of Jerusalem and the Temple. This event happened within a generation of the Olivet Discourse – just as Jesus had prophesied. This is what I believe scripture reveals! Related Articles: The Last Days – Of What?, Melting Elements, Mystery Babylon, Heavens and Earth Shall Pass Away, Are We In The Laodicean Church Age?